Car and body shops provide top quality service and repairs. Yet they aren’t essential for all types of damage. If your Mazda has received body damage in the form of dents, dings, or creases, a body shop might not be the best course of action. Paintless dent repair is specifically designed to remove such dents, dings, and creases from your Mazda in a timely, efficient manner. Even better? Paintless dent repair is often much cheaper than getting dents repaired at a body shop. The benefits of paintless dent repair are numerous, but they boil down to three main factors: focus, process, and cost. Let’s start with cost. 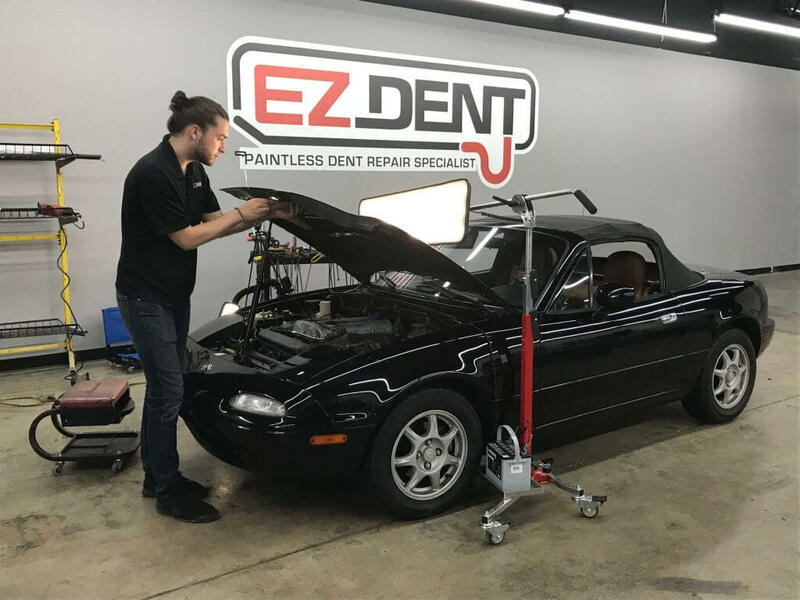 Because EZ Dent focuses solely on exterior body work, our overhead, processes & estimates can be spot on and more affordable than a full-service body shop. Here at EZ Dent, we also focus specifically on dent repair and removal. That’s our specialty and it’s just about all we work on. Our specialization enables us to use the best tools and techniques to remove dents, dings, and creases from your Mazda. Our focus on this area also means that our process is much faster than dent repair from most body shops. Finally, our dent repair and removal process doesn’t require replacement parts. We use our special tools and techniques to pull, push, and otherwise massage dents and dings out of your Mazda’s body. That means your car is still left with the same paint and body parts. No painting or replacements are involved. EZ Dent serves Athens and North Georgia. If you live in the area, we’d love to talk about paintless dent repair. *Disclaimer – EZ Dent is not affiliated with Mazda or authorized Mazda dealerships. Contact us today for a free quote for dent repair and removal for your Mazda.